Hungary, located in the centre of Europe, has been part of the European Union since 2004 and part of the Schengen Countries since 2008. Its local currency is the Hungarian Forint (approx. 300 Forint for 1 EUR, 280 Forint for 1 USD). Safe country with a stable democracy and economy, it’s one of the most affordable destinations in Europe. Its capital city, Budapest, can be reached within 2 to 3h from most of European capitals by daily flights. 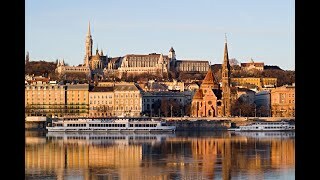 Budapest, the Capital of Hungary with a population of two million, is reachable within 30 minutes by coach from the international airport, which makes it a very attractive city also for short trips. The majestic Danube river separates both parts of the capital city (Buda Castle on the hilly part of the city, the residential area and Pest the vibrant city centre with beautiful architectural sites as well as the area for shopping, nightlife, and gastronomy. UNESCO declared Budapest, the Hungarian capital, ‘The Pearl of the Danube’, a World Heritage site. Budapest combines classical features (historical architectural sites, art, music, traditions, and thermal bathes) with a modern touch (gastronomy, trendy places and activities, nightlife) and a great sense of hospitality from the locals. Hungary may have made Goulash world famous, but today’s Hungarian gastronomy is also about fine culinary experience (4 Michelin star restaurants in the capital) at affordable price, with excellent wines from one of the many wine regions. One of the main features of Hungary is its thermal water, one the world’s largest reserve. Apart from Budapest, the Hungarian country side is well worth a visit, with its wine regions (e.g. Tokaj), the Danube Bend, Lake Balaton, Central Europe’s largest lake, among others. * Budapest and its surroundings, one of the most beautiful cities in the world, has it all with history, culture, gastronomy, fun and modern infrastructure to welcome tourism from all over the world. The Ruin bars district among others add to the uniqueness of the city. * Eger-Tokaj wine region, world known for its delicious beverage is aslo a beautiful region to visit. * The Puszta, great plain with endless, flat steppe, well-preserved village life and folk art, thermal baths and spas. * Central Transdanubia stretches from the Danube to Lake Balaton with the enchanting countryside, hills, splendid natural treasures and historic monuments, as well as small villages nestling in the valleys. * Southern Transdanubia, a varied landscape with flat terrains stretching between green hills, and valleys, lies south of Lake Balaton.